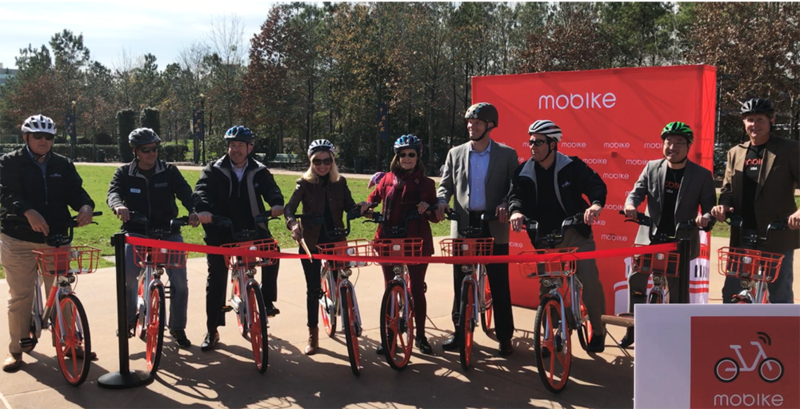 On Friday January 5, 2018, community leaders and planners of The Woodlands met at Town Green Park to celebrate a new partnership between The Woodlands Township and the world’s premier bike sharing platform, Mobike. Mobike is a Chinese bike sharing company that utilizes smart phone technology and GPS data to allow people to pick up, ride, and drop off Mobike bicycles at their own convenience, for a price of $1 per 30 minutes of use. The bikes are designed with punctureless tires, smart locks, and disc brakes to be as safe and durable as possible. Mobike is a turnkey operation, and it is providing 50 smart-bicycles for use in The Woodlands at no cost to the local government and taxpayers. The Woodlands is the third township/municipality in the US, and the first in Texas, to receive Mobike’s services following its rapid expansion to 200 cities around the world in the past two years. Download the Mobike smartphone App. Enter your phone number and credit card information. Find an available bicycle on the Mobike map. Scan the QR code on a bicycle with the Mobike app, and go for a ride. Manually lock the smart lock on the bicycle to end your rental. “We really appreciate how forward thinking The Woodlands Township has been. This is a really beautiful community with lots of bike paths and a very active lifestyle, so we think there is a really strong fit between our organization and the local community here,” said Jason Wong, the United States’ general manager of Mobike. “We started The Woodlands with 50 bikes. We’re going to take a look at the data and demand and work closely with The Woodlands Township officials on where we are going to go from here,” he explained. “Each of these bikes has a smart lock, which has GPS and helps us track the location of the bikes, which is really important so they don’t get lost. Also, you get data on where and when bikes are needed the most, based on what we’re seeing overall in the marketplace. That’s data that we share in our partnership with local officials," Jason Wong explained. "What we see in communities around the world, is that local governments then take some of that data and create new bike paths where they see usage data. It really is an approach to improve the quality of transportation options." Mobike recently received one of only six Champion of the Earth awards presented by the UN in 2017 for its innovative contribution to low carbon transportation.